Becky Thompson is a blogger and author whose career path drastically changed when God put a new calling on her heart. Her new book, Truth Unchanging is a 75-day devotional for moms to set aside a few moments with God. Truth Unchanging is available April 16th on Amazon and beckythompson.com. Check out her special Backstory interview with Robert down below! Emilee Taylor is a member of the Shepherd’s Grove/Hour of Power Worship Team. Today, Emilee performs “In Christ Alone” (comp: Keith Getty, Stuart Townend; arr & orch M. Riley). She is accompanied by Dr. Marc Riley and the Hour of Power Orchestra, and Dr. Irene Messoloras and the Hour of Power Choir. Aaron Al-Imam is a vocalist from Orange County, California. A music education major from Vanguard University, Aaron teaches private piano and vocal lessons. He is currently a member of His Place church in Westminster, California, where he is the worship team and ignite youth pastor. Today, Aaron performs “O Praise the Name (Anastasis)” (comp: Benjamin Hastings, Dean Ussher, Marty Sampson; adapt M Riley). Aaron is accompanied by Dr. Marc Riley and the Hour of Power Orchestra, and Dr. Irene Messoloras and the Hour of Power Choir. Directed by Dr. Irene Messoloras, the Hour of Power Choir performs “Come Thou Fount of Every Blessing” (comp: Robert Robinson; arr: Mack Wilberg). They are accompanied by Zeljko Marasovich on the organ, and Dr. Marc Riley and the Hour of Power Orchestra. Thank you for the love, Chris. We are so glad that this sermon blessed you! God is good! He loves you and so do we!! I have been a Christian for 50 years and I just had to tell you this sermon was the best I have heard for a long time. I have played it over several times. I have felt a call I g towards meditating and you made it so simple to cast it all on Him who is in control. Hi Arlene! We are so glad this sermon blessed you! God is surely faithful and it’s such an encouragement to hear that you are still growing and learning after walking with Jesus for 50 years. Thanks for sharing with us. God loves you and so do we! Hi Nicolas! Thank you for writing to us. 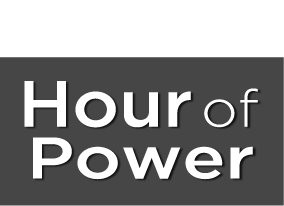 We are so glad that Hour of Power is still blessing you – it’s our honor to be a part of your life! God loves you and so do we! Thanks Bobby for your encouragement and reminder of the power of our God. Was feeling down from the presence of my wife of 60 yrs now in care home. Hi Allan! We are sorry to hear about your wife’s deteriorating health, and we are praying for you as you continue to love and care for her. May Jesus lead and guide you in this difficult season — He is surely faithful. God loves you and so do we! Thanks for encouragement and reminder of God’s wonderful love. Was very down resulting from downturn in my precious wife’s health after 60 years together, now in care home.